At first sight ( suggested by its title) I think this will be some sort of dictionary of the brands, elements, inspirations and highlights of the history of 10 Corso Como, hot spot, shopping and dining complex in Milan, created by Carla Sozzani. Initially, a gallery (Galleria Carla Sozzani) 10 Corso Como became a space for art, shaped by her founder's personal taste, which was in charge to turn this place into a cultural exchange spazio incorporating a design/ fashion store, an expanded bookshop and a garden café that has become one of the must-go destinations in Milan when it comes to the latest in fashion, photography and design. 'A description of Sozzani's world and her opinions on fashion travel, design and lifestyle'. 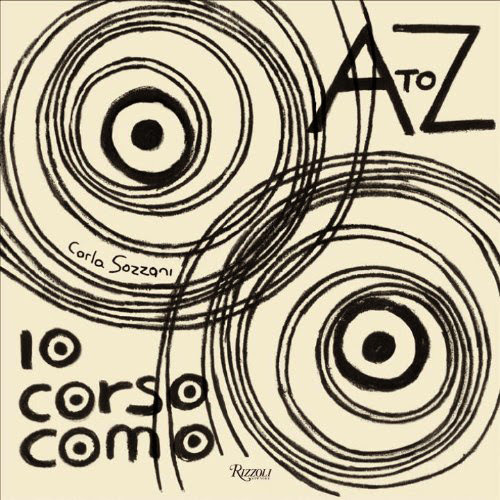 '10 Corso Como: A to Z' by Carla Sozzani is set for release on Sep 24 by Rizzoli. The Male Model Music Project has visited 10 Corso Como in the past during previous trips to Milan Men's Fashion Week, to buy some books and cd's!